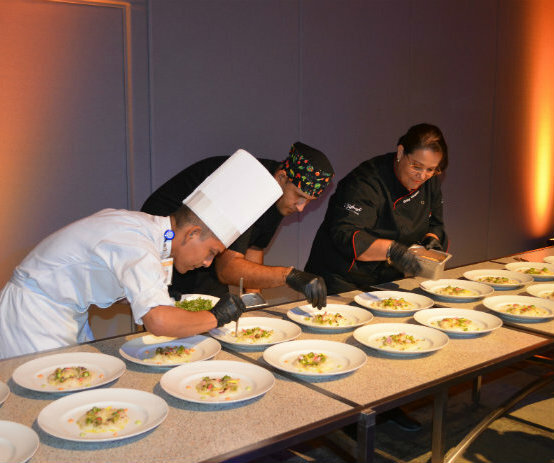 The activities leading up to the 2017 Vallarta Nayarit Gastronómica began with a spectacular gala dinner at the Vidanta Nuevo Vallarta development; Riviera Nayarit highlighted the camaraderie between the participating chefs. Seven distinguished chefs working alongside each other, the spectacular facilities at Vidanta Nuevo Vallarta, and the best wines all came together for a magnificent dinner that served as a preview—a “taste”—of what’s to come in October 2017 during the 9th Vallarta Nayarit Gastronómica, when the region will welcome 34 chefs (who boast 14 Michelin stars and 20 Soles Repsol among them) and 10 sommeliers. Called the KickOff Vallarta Nayarit Gastronómica, the event brought together six of the top advocates of Mexican gastronomy along with Paco Roncero, one of the premier representatives of cutting-edge Spanish cuisine, who boasts two Michelin Stars and three Soles from Guía Repsol, a recognition not only of his kitchen but of the attention to detail he embraces with everything involved in the culinary rituals. Vidanta’s new convention center welcomed the attendees, all lovers of fine cuisine, who were there to enjoy a one-of-a-kind experience with an 8-course menu where each of the chefs included his or her own special touch. The pairings were with wines from L.A. Cetto and a selection of Spanish wines. 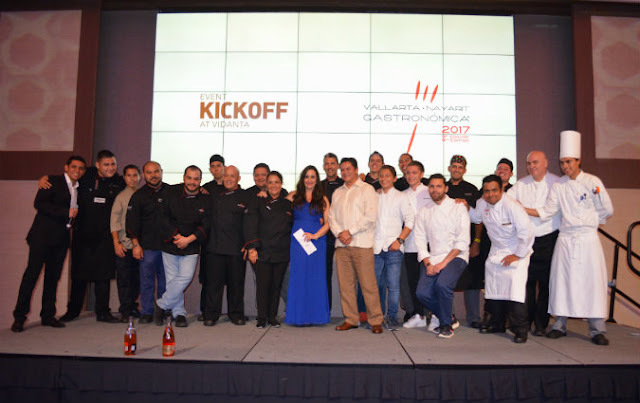 Once the dinner was over the chefs gathered on stage to the bask in the applause of the attendees and the gratitude of organizers Carlos Elizondo and Consuelo Elipe, as well as the hosts, represented by José Alonso, Director of the Vidanta Nuevo Vallarta Development. 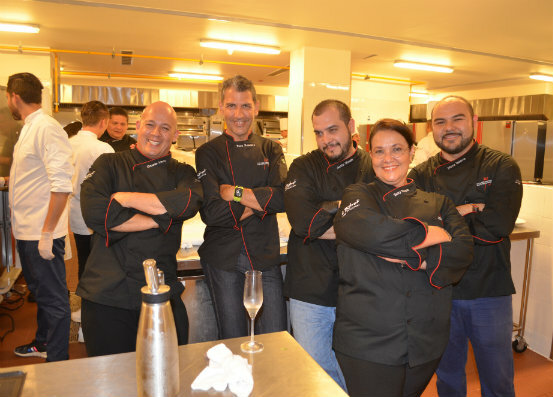 Betty Vázquez, Culinary Ambassador for the Riviera Nayarit, spoke on behalf of the chefs, highlighting the camaraderie that reigned in the kitchen during the preparation of the dinner. Gerardo Iriarte, Executive Chef for Grupo Vidanta, began the dinner with a foie gras appetizer marinated in Armagnac with passion fruit, truffle oil, vanilla and green apple crumbles al Sauternes, paired with a Private Reserve Chardonnay from L.A. Cetto. 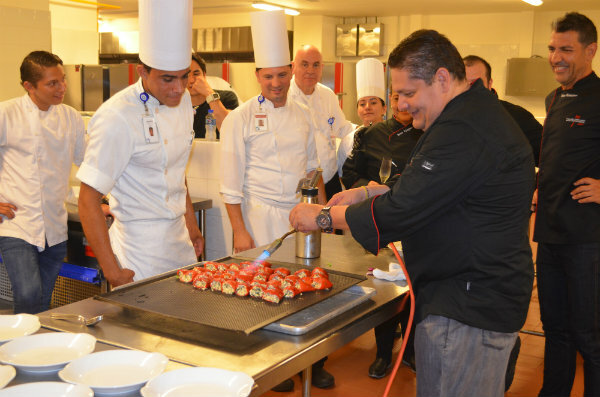 Chef Paco Roncero was in charge of the first course with a dish called “XXI-Century Tortilla,” a deconstruction of the traditional Spanish omelette made with potatoes. It was served in a cocktail glass with a layer of caramelized onion topped with an egg Zabaglione and potato foam ringed with olive oil. This was accompanied by a bottle of Oscar Tobía Reserve white from La Rioja, Spain. Chef Betty Vázquez, the Riviera Nayarit’s Culinary Ambassador and owner of El Delfín restaurant in San Blas, presented a refreshing ceviche as the second course. This very traditional dish from the coast of Nayarit was served with miltomate, serrano pepper, cilantro, toasted corn and roasted chile de árbol mayonnaise. This was accompanied by a bottle of Cava Castell de Ribes Brut, from Spain. The third course prepared by Chef Marco Valdivia from Tepic’s Emiliano restaurant, who served an exquisite and very traditional dish from Nayarit: taxtihuil and shrimp meatballs, paired with a Cava Castell de Ribes Brut Rosé from Spain. Chef Bricio Domínguez from El Rincón de los Milagros in Guanajuato prepared the fifth course with a piquillo pimento dipped in xonocostle jelly, filled with escamoles (Moctezuma’s Caviar) and served with a smoked criollo bean sauce. It was paired with an Alma de Tobía rosé fermented in the barrel from the Rioja region. A grand Tomahawk cut with agave honey, habanero chocolate and black truffle oil made up the fifth course, created by Chef Aaron Mizrahi, the Creekstone Farms Ambassador. The dish was paired with a Boutique Syrah by L.A. Cetto. Last but not least, Chef Elías Sapién Jr., from Evole Eventos in Guadalajara, and Chef Paco Roncero presented two amazing desserts: Sapien created a candied Mexican fruit and coconut temptation—he even brought in real palms and hung two coconuts from them filled with coconut pulp frappe. Roncero made a pineapple stew with yoghurt foam—it was light, healthy and delicious. The wines chosen to accompany these two desserts were a Chambrulé Brut and a Moscatel & Palomino, both by L.A. Cetto. The liqueurs were from Casa Sauza and Hennessy. The “sabering” ceremony of a bottle of Moët & Chandon Brut Rosé by Master Habano Sommelier Yamir Pelegrino and L.A. Cetto’s Master Sommelier Fernando Ruiz de Chávez was one of the highlights of the evening.